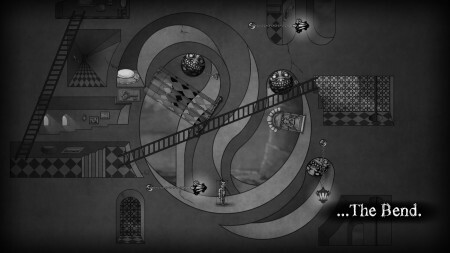 The Bridge has generated positive reactions since winning the Indie Game Challenge 2012 awards for Achievement in Art Direction and Achievement in Gameplay. The music wasn’t created by anybody directly involved with the game; instead, composer Kevin MacLeod provided the accompanying tracks – without actually knowing it. I spoke with the Ty Taylor, one of the two creators of The Bridge, and Kevin MacLeod, a Creative Commons composer who offers up his music for free, to learn more about the story behind the music of The Bridge. 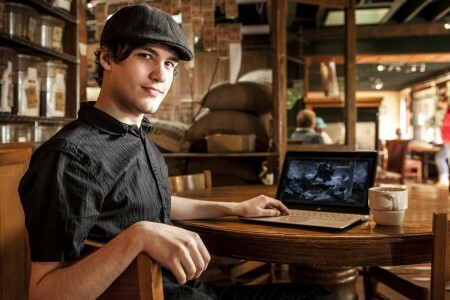 When creators Ty Taylor and Mario Castaneda set out to create The Bridge, a large-scale project for their respective college majors, they created a beautiful mind-bending puzzle game. Incorporating a minimalist sketch-like animation to evoke an elegant, thought-provoking, often unsettling journey, Taylor and Castaneda channeled the artwork of M. C. Escher to create spatial puzzles that simply couldn’t exist outside of the game. For their music, instead of bringing in a third party composer, they elected to go a different route, and search through the Creative Commons for music that that give players the vibe they were hoping for, one that would match the distorted puzzles of The Bridge. When searching for music, Taylor and Castaneda came across a website called Incompetech, a Creative Commons website run by composer Kevin MacLeod. Incompetech features a massive range of music composed by MacLeod that is offered for free, on the condition of proper citation. MacLeod, who also often takes commissions and consultations, usually does not receive notification about the use of his work. The downside to using the Creative Commons method is the potentially lengthy search process for just the right music. While a hired composer has the responsibility to compose what is requested of him or her, Taylor and Castenada had to use what they could find already composed in the Creative Commons. On the other hand, they also have complete control over the tracks they choose, and from a site like Incompetech, the range is massive. In fact, MacLeod often finds music in projects that may not bethe best representation of that genre on his website. As a result, MacLeod also offers consultations (for a fee) that helps soundtrack seekers narrow down the range of results based on a description. However, due to the time and effort it takes to search through the site and match pieces to what the customer is looking for, a commission may actually be cheaper, and be just a strong – if not stronger – a representation of what the customer is looking for. Taylor discovered Incompetech based on MacLeod’s reputation for quality Creative Commons music, and decided to search for the sound he was looking for on his own, with Castaneda. With some artwork already drawn, Taylor set out to find music from Incompetech that would fit the needs of The Bridge. Interestingly, the design of The Bridge has the same ambiguity MacLeod was thinking of with his preludes. The game is at times amusing, at times melancholy, and at times strangely peaceful. It opens with the protagonist, an aging man, taking a nap under an apple tree and waking up after an apple falls off and hits his head, Newton-style. He proceeds to head back inside his house, where the doors in his hallways lead him to the strange and unusual puzzles that the player has to solve. Frequently, the puzzles are downright beautiful – spiraling shapes and swinging pendulums – and often they are haunted by spherical entities with grotesque faces. The Bridge also came with a trailer accompanied by one of the tracks used also used in the game: “A Comfortable Mystery 3,” a lighter and more delicate track than the others. This track consists solely of MacLeod on his electric piano, playing a music box-like theme that fits both the need for a trailer and for a part of the game. It stands out from the rest of the pieces, being the only one on a solo instrument without any strings (for which MacLeod used, at the time, Garritin’s Personal Orchestra). Throughout this entire process, MacLeod and Taylor neither met nor even spoke with each other, as MacLeod makes his policies very self-explanatory on his website: any music may be used for any project without contact or payment, so long as proper accreditation is given at the end of any project. His library is divided by moods, styles, or alphabet, and any piece is search-able. After discovering the names of the tracks Taylor used, finding and downloading the pieces to listen to isn’t difficult. For tracks like “A Comfortable Mystery 3,” there are, naturally, a couple of other versions of the song that MacLeod has on his website, just as available for listeners and project designers. The Bridge was first released in February of 2013 on Steam, and has maintained its audience’s attention since then, gradually released on Xbox, Amazon App Store, and Playstation Network over the last couple of years. Most recently, it was released on the Wii U in August of this year. While Ty Taylor and Mario Castaneda continue to enjoy the praise generated by the small but carefully crafted game, Kevin MacLeod continues his work in Creative Commons composition, commissions, and consultations to ensure future projects have the same musical access. Posted on October 9, 2015 by Emily McMillan. Last modified on October 9, 2015.